More than $148 billion was raised and invested in these sectors during 2007 – 60% more than 2006 – even as the credit crunch spread, deepened and weakened the US and other economies. Though the bulk of investment capital flowed into Europe and the US, respectively, the share of total investment accounted for by China, India and Brazil increased 14-times in absolute terms – from $1.8 billion to $26 billion, and from 12% in 2004 to 22% in percentage terms last year, according to the UNEP study, which was prepared by New Energy Finance. 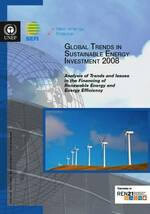 “Sustainable energy transaction volume” as defined by UNEP totaled $204.9 billion globally in 2007. Some $98.2 of the total flowed into new renewable energy generation; $50.1 billion went into technology development and scaling up manufacturing. Mergers and acquisitions accounted for $56.6 of the total. Wind energy led the renewable energy field, attracting more than $50.2 billion of investment capital. Solar power was the fastest growing segment of the market, attracting approximately $28.6 billion in 2007, which translates into an average annual growth rate since 2004 of 254%. “The clean energy industry is maturing and its backers remain bullish. These findings should empower governments – both North and South – to reach a deep and meaningful new agreement by the crucial climate convention meeting in Copenhagen in late 2009,” Achim Steiner, UNEP’s executive director, commented in a media release. Renewable energy and energy efficiency investment was subdued by the end of 2007 and into Q1 2008 with banks tightening credit and restructuring in the US ethanol industry as concerns over rising food prices and supply shortages took their toll. Investment flows rebounded in most sectors during Q2, however, even as economic and geopolitical concerns hung overhead. Sustainable energy venture capital and private equity in rose 34% in Q2 2008, new asset finance was up 8% and public market investment was showing a strong recovery, as exhibited by Portuguese utility EDP’s spinning off its renewable energy business, EDP Renovaveis, in an IPO, according to the study. “Just as thousands were drawn to California and the Klondike in the late 1800s, the green energy gold rush is attracting legions of modern day prospectors in all parts of the globe,” said Steiner, who is also a UN Under-Secretary General. Interested in listening in on an executive summary of the report’s findings? You can download the full report, as well as listen to a podcast of Steiner doing just that in various languages here.